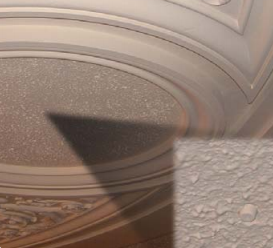 Traditionally, there was no alternative to surface mounted detection, but Aspirating Smoke Detection (ASD) is here to save the day, minimizing cosmetic impacts and eliminating some of the limitations of conventional smokes detectors. ASD addresses every bullet point above, plus provides a wider range of sensitivity (.0015 to 6% obscuration/ft), continuous air sampling, calibration-free operation, no interference from dust or particulate matter, and the ability to be nearly hidden in highly flexible detection points. Can you see the ASD sampling point? 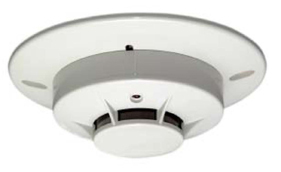 ASD systems rethink smoke detection with a central unit able to be mounted at ground level for easy access and maintenance. From that central control unit, constant air sampling is managed by drawing air through many sampling tubes that can each be run up to 164′ away. The pipes are very small in diameter, so they provide options for hidden installation and sampling tips are barely visible once secured. Depending on the model, a single central control unit could cover over 21,500 ft²! One of the most important advantages is only the central control unit needs to be tested by a technician. Therefore, restricted-access, sensitive-area or difficult-to-reach sampling point locations do not need to be visited during routine inspections. This saves A LOT of time and can reduce inspection costs dramatically. As with any building, new construction is ideal for efficient installation, but ASD is easily added to existing systems, replacing existing smoke detection and efficiently adding new sampling points at minimal additional cost. Contact us today if you would like to talk about ASD and your building!